Engineers at Stanford University appear to have come up with a way to make solar cells and batteries more efficient by “decorating” nanowires with chains of nanoparticles. 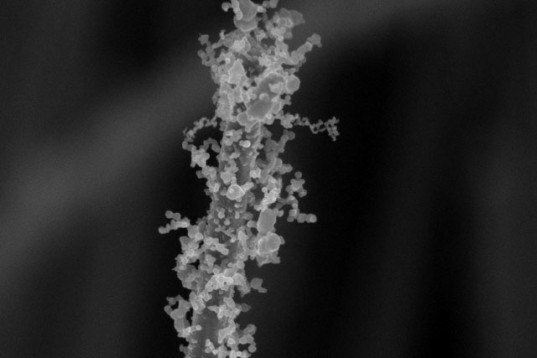 The process has been likened to dressing up the nanowires with jewelry, a step which helps to enhance their catalytic and electrical performance. The process is simpler and faster than previous techniques, and the development could lead to better lithium-ion batteries and more efficient solar cells, according to a study published in the journal Nano Letters. Adding ornamentation to nanowires doesn’t just make them look pretty under the microscope; it creates intricate patterns that are full of nooks and crannies that increase overall surface area. Changing the surface area at the nanoscale can actually alter the surface chemistry of nanowires, because catalytic activity depends on the availability of active sites on the material’s surface. Engineers at Stanford University appear to have come up with a way to make solar cells and batteries more efficient by "decorating" nanowires with chains of nanoparticles. The process has been likened to dressing up the nanowires with jewelry, a step which helps to enhance their catalytic and electrical performance. The process is simpler and faster than previous techniques, and the development could lead to better lithium-ion batteries and more efficient solar cells, according to a study published in the journal Nano Letters.